Remove the rind from the cheese, then cut the cheese into small pieces. Melt gently in half of the (warmed) cream and leave to cool. Peel and deseed the tomatoes. Remove the stalk from the pepper. Cut in half and remove the pith and seeds. Chop the tomatoes and pepper into small pieces. Peel and chop the banana shallot and two garlic cloves. Sauté the chopped garlic and shallots in two tablespoons of oil, add the pepper and tomatoes, season with salt and pepper, and leave to simmer for 30 minutes. At the end of the cooking time, blend the tomato soup and season with Tabasco. Leave to cook before placing in the refrigerator. Place the remaining garlic clove, pine nuts, basil leaves, oil and a pinch of salt in an electric blender. Blend until you have a nice green sauce. Whip the 200 ml of whipping cream until firm. Carefully fold into the Chabichou du Poitou mixture, as you would for a mousse. 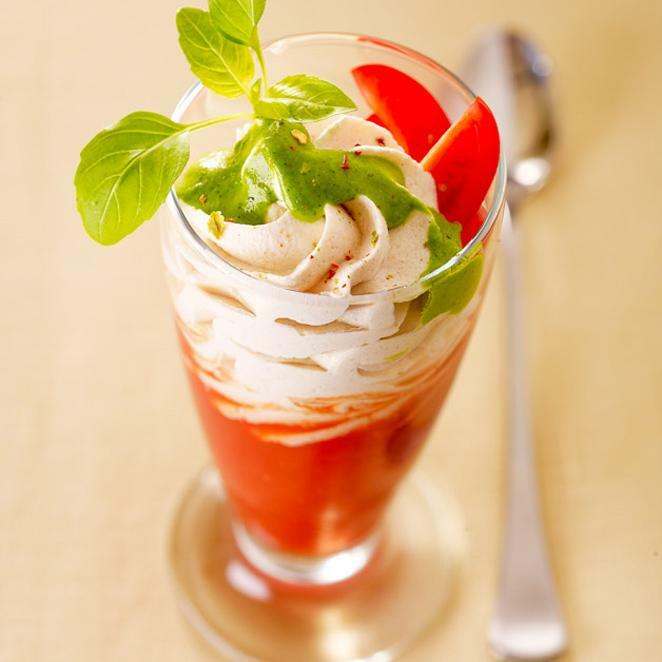 To serve, pour the tomato soup into tall glasses and top with Chabichou du Poitou chantilly cream. Pour the basil sauce over the top, decorate with cherry tomato quarters, and garnish with a sprig of basil.